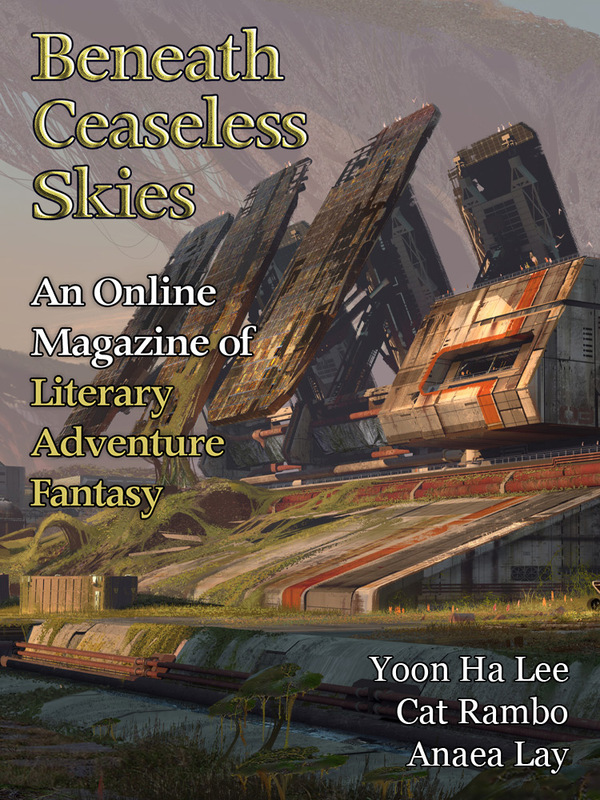 Special double-issue for BCS Science-Fantasy Month 3, featuring a bonus story, a bonus podcast, a science-fantasy episode of the BCS Audio Vault podcast, and science-fantasy cover art “Research Lab” by Sung Choi. Even in human-shape, I had an excellent sense of smell. I had no difficulty tracking the pilot. She lay on her side in the lee of a chunk of rubble, apparently asleep. The remains of a Brick Ration's wrapper had been tossed to the side. She had downed all of it, which impressed me. But then, I'd heard that piloting was hungry work. Nuclear physics was not typically a fox specialty, although my mother had allowed that astrology was all right. Today her sleeves are sewn with opals and moonstones and within their glimmer here and there on the left sleeve, glitters another precious stone, set in no particular order, random as the stars. Her skirt and bodice are aluminum fish-scales, armored though she expects no fight. Her only weapon is her own considerable wit. The glass-marbled plaza before the gates murmurs with spans of pigeons in the early light. A Bright Courier never looks back, never regrets, but when I crested the bank I turned to her. Her scales were gray and shimmering under the golden light of the double moons, her sails reflecting the ether-glow we sailed upon to travel between planets. I'd sacrificed a valve of my heart, a length of my gut, and an impossible desire, all to have her grown for me. From me. It wasn't looking back, that last glance. You can't look back at your present self. Her scales were gray and shimmering under the golden light of the double moons, her sails reflecting the ether-glow we sailed upon to travel between planets. She had never imagined that she—the greatest scryer of her generation—could be lied to and tricked by her own husband.